The whole world at your fingertips! If you’ve ever wanted to be an explorer then now’s your chance! Travel to far-flung corners of the globe without ever leaving your sofa. All it takes is a flick of the wrist! Journey millions of miles across the planet just by spinning a Smart Globe from Oregon Scientific. 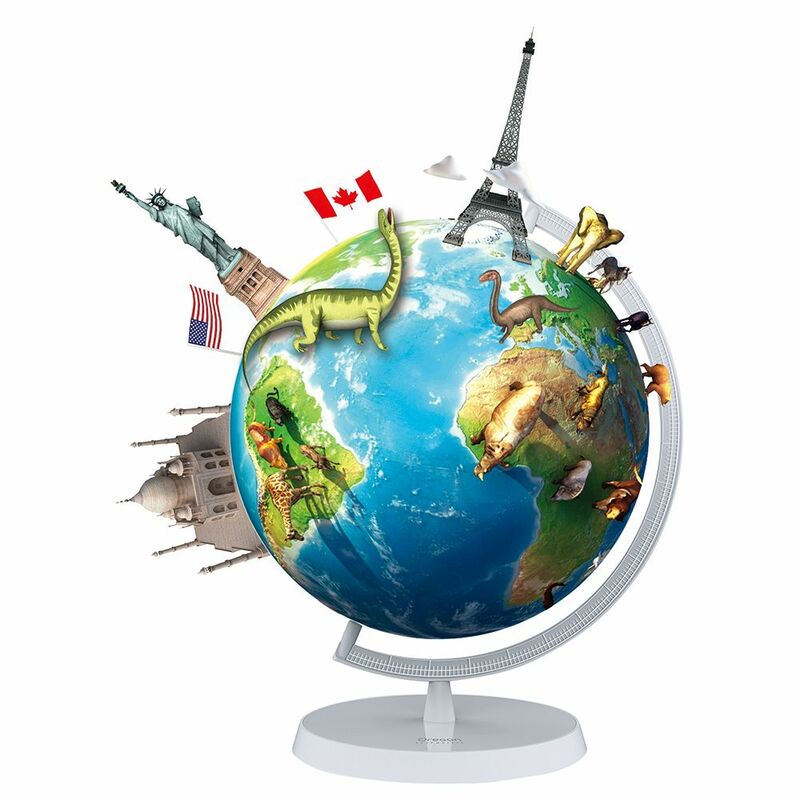 Each globe contains a world of knowledge for you to discover plus tons of fun games and challenges. What’s more, each globe offers 3D augmented reality content for a truly immersive experience. You’ll learn about landscapes, animals, landmarks and even dinosaurs. Roar-some! The inflatable Smart Globe Air pumps up in a master of seconds. Display it proudly on its portable stand or play with it as a beach ball! The Smart Globe Myth transforms into a an illuminated map of constellations and planets with the simple switch of a button. And use the Smart Globe Adventure‘s Smart Learning Pen to unlock a wealth of fun information about continents, capitals, populations, geography, culture and more! Open up the Smart Globe Explorer to reveal interesting info about the Earth’s flaming hot core and learn about how our awesome planet fits into the solar system. And turn on the Smart Globe Starry‘s night mode to watch it transform into an illuminated map of constellations and planets. Wow! Check out these fab facts about our beautiful blue planet! The Earth isn’t perfectly round. It measures roughly 40,075km around the equator but about 67km less when measuring from pole to pole! Roughly 71% of the Earth’s surface is water. With a massive 96.5% of that being held in our oceans. Though humans have only ever explored about 5% of the world’s oceans, we have been to their deepest point – the Mariana Trench. It’s a whopping 11km deep (for comparison, Mount Everest his only about 8.8km tall)! All the Earth’s landmasses were once held together in one giant supercontinent known as Pangea, so in theory, you could have walked from Canada to New Zealand! Death Valley, USA holds the record for he hottest temperature ever recorded on Earth – a sweltering 56.7 °C. The coldest temperature was measured in Antarctica – a chilly −89.2°C. Brr! The Earth’s core is made of solid iron and is estimated to be a toasty 6,000°C. That’s as hot as the surface of the sun! The Earth is roughly 4.5 billion years old. It’s thought that the first life on Earth evolved 3.7 billion years ago, but human beings have only been around for a measly 200,000 years! Click HERE for your chance to win an Oregon Scientific Smart Globe Explorer! Masha and The Bear’s Easter egg-venture! It’s time for more madcap fun and mischief with Masha and her animal friends!